DAYTONA BEACH, Fla. – Just hours before today’s highly anticipated ARCA Racing Series presented by Menards season opener at Daytona International Speedway, driver, Leilani Münter, addressed the media at the ‘World Center of Racing’ unveiling her extended 2018 series schedule. Following a busy morning of appearances, Leilani proudly introduced her No.20 VEGANSTRONG.com Daytona car along with a season schedule which will feature the Rochester, Minn. native in eight series events – the most single-season events she’s competed since her series debut in 2010. Leilani, a biology graduate, turned race car driver and environmental activist with support from A Well-Fed World and TRYVEG.com (VEGAN STRONG), will start today’s race from the fifth-starting spot – a career best. In addition to Daytona, Leilani will compete at Talladega Superspeedway (4/27), Charlotte Motor Speedway (5/24), Pocono Raceway (6/1), Michigan International Speedway (6/8), Chicagoland Speedway (6/28), Pocono Raceway (7/27) and Kansas Speedway (10/19). An advocate for plant-based diets, solar power and animal rights, Leilani has made a career racing for a cause. Her past race cars have included messages regarding renewable energy and clean energy legislation as well as award-winning documentaries The Cove and Blackfish. In addition to racing, Leilani will reinforce her VEGAN STRONG message during Saturday’s pre-race festivities and continue through the Daytona 500. As part of an extensive sponsorship activation campaign, Leilani’s VEGAN STRONG team will be front and center outside the stadium giving away samples of the revolutionary Impossible Burger, a 100% plant-based burger made for meat lovers. The samples will be prepared with both Miyoko’s Kitchen vegan butter and Follow Your Heart’s Vegenaise. Leilani will appear Sunday, February 11 and again February 15-18 at her VEGANSTRONG.com display located in the fan-vendor area outside the front entrance of Daytona International Speedway. In addition to Daytona, Leilani’s VEGANSTRONG.com track display will be present at Talladega, Charlotte, Chicago, and both Pocono events. Leilani affectionately referenced as a ‘vegan hippie chick with a race car’ was named the #1 eco athlete in the world by Discovery’s Green Planet and Sports Illustrated once named her one of the top ten female race car drivers in the world. For more than a decade, Leilani has adopted an acre of rainforest for every race she runs. 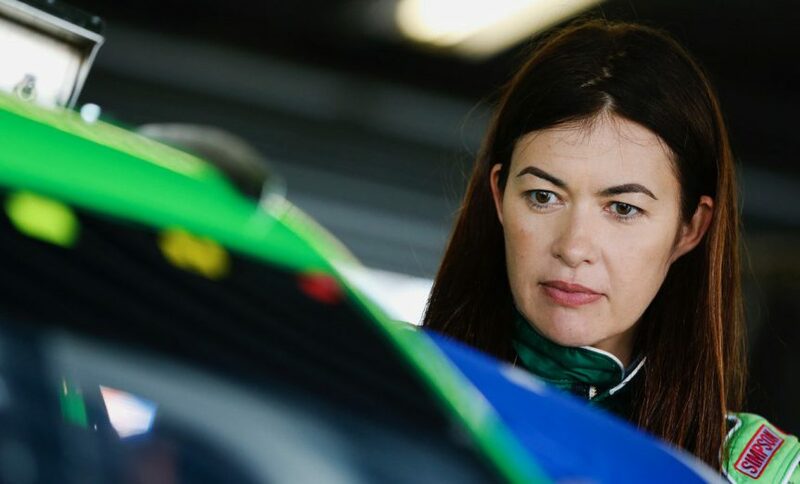 She has raced both open wheel cars (Indy Pro Series) and stock cars (NASCAR Elite Division, ARCA) and has recorded nine top five and 19 top ten finishes in 52 starts. A board member of the Oceanic Preservation Society, Leilani is featured in their documentary Racing Extinction. Leilani also serves on the board of Empowered by Light and EARTHx Film. She has been an Ambassador for Ric O’Barry’s Dolphin Project since 2010. Leilani is a vegan, and her personal car is a 100% electric Tesla Model S which is powered by the solar panels on the roof of her home.